It’s always a sign that things are going well when a club acknowledges after a 79-point win that there’s still so much work to be done and improvement to come. 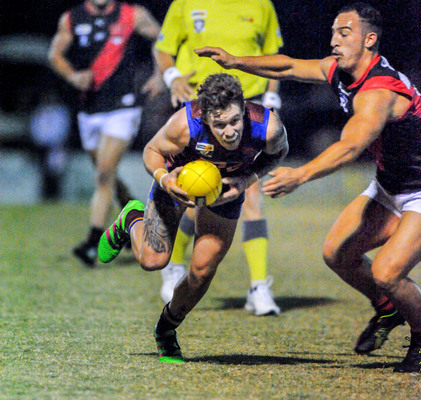 While Pakenham’s thrashing of Emerald under lights at Toomuc Reserve on Saturday night to kick start their new beginning in AFL Outer East was by no means flawless, it was a sign that the Lions are going to be a side hard to stop if they can put all the pieces together and gel cohesively with their extremely youthful looking side. The Lions ran rampant over the Bombers to register 26 scoring shots to just seven, holding the Bombers to just a goal in each half and once again showcasing their stingiest in defence in the eventual win, 14.12 (96) to 2.5 (17). Racing out to a 17-point advantage at quarter time that quickly became 38 at the major break, the two sides fought out a dead-even third term, but the Lions put the foot down with a dominant 6.5 to scoreless final term to pick up a rare opening round victory. 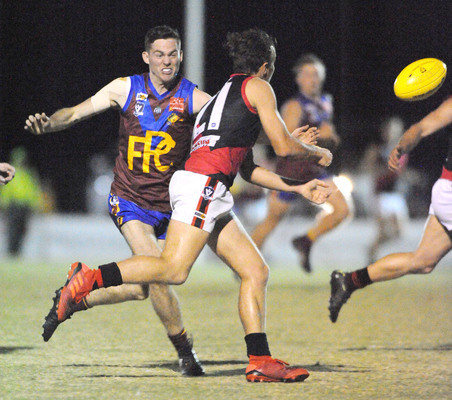 “Over the last two years, we’ve really struggled to kick a winning score basically, or around the 100 points,” Pakenham coach Ash Green said of the performance. “Ultimately, if you can get around 100 points, it puts you in a strong position to win games of footy. “So I was really pleased with our effort – we had multiple scoring opportunities and multiple goal kickers which is good, but we’ve got some serious work to do. “The positives are, it was our first win in Round 1 in three years, and obviously a lot of people are interested in the new league with the new clubs, so it certainly builds some excitement and expectation. “But we’re under no illusions, it’s a work in progress with a young team, and we’ve got to keep working and making sure we’re improving every week. Green said that despite picking up the massive win, there are still so many unknowns with the new league, and won’t read too much into the result, just yet. “We’re still understanding the league as well, and when we start to play these new teams week-to-week, the main players, and strengths and weaknesses, it will just continue to be a work in progress,” he said. The Lions were well served in attack by James Harrison, Jake Thompson and Joe Baker-Thomas, who combined for seven goals, but pleasingly had 10 individual goal kickers, with Jack Kowarzik, Tyler Guan and Jarrod Theisz also extremely impressive. 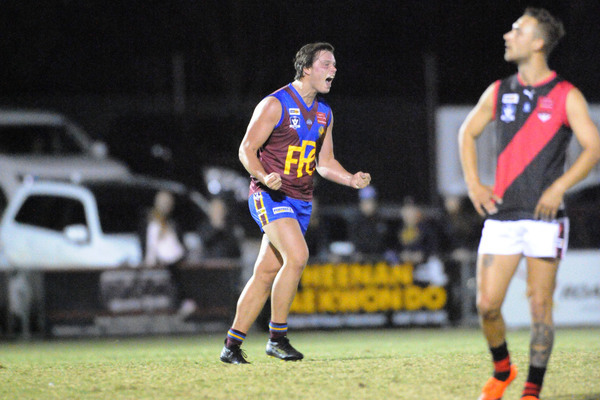 But, it was once again the defensive side of the game – one that held them in good stead in the final season of SEFNL – that was most impressive, with Green singing the praises of his defensive unit. “Your best form of attack is defence, and we’ve got some really good defenders – we’re pretty fortunate and flexible, we can throw different combinations down back,” he said. “To have Josh Tynan play his first game for us was fantastic after 12 months off with injury, and we recruited Dermott Yawney down back and he was a class act too. For Jamie Marshall’s side, Rogan Goonan, Mitch Thomas and recruit Ty Ellison all had some good moments. The Lions will next take to the field in a Anzac Day blockbuster against Officer at Toomuc Reserve on Thursday 25 April, and Green said that his young side can’t wait to take it up to the Kangaroos. 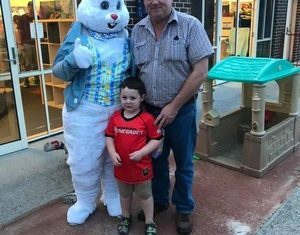 “Officer know our list quite well, and they know our ground too, so I’d assume we’ll have two red-hot sides having a real crack on Anzac Day, and we expect a good crowd will come down and witness a good game of football,” he said. In other matches across the weekend, Monbulk got its season off to a strong start with a 33-point win against Belgrave, 6.6 (42) to 10.15 (75). The Hawks could have very easily put the game to bed after kicking 4.7 in the opening quarter, but kept the door ajar for a Magpie comeback after a three goal quarter to the home side. But, Andrew Williams’ group slammed the door shut in what was a low scoring two goal to one last half, running out comfortable winners. For the Hawks, Dylan Werts, Kris Fletcher and Brodie Emmett were all among the best, while for the Magpies, Daniel Noy and Jason Bartils battled valiantly. And Mt Evelyn spanked Warburton Millgrove at home on Sunday, 17.21 (123) to 5.9 (39). Boom recruit Max Kleverkamp was best afield in a dynamic three-goal display for the Rovers. Doveton and Officer will cap off the opening round with a Good Friday blockbuster at AJ Robinson Reserve, with the two highly fancied south-east clubs set to draw a monster crowd. Other Round 2 matches in Division 1 on Saturday 27 April include a big clash between Emerald and Belgrave, Warburton Millgrove and Doveton at Mac Sparke Oval, Mt Evelyn and Monbulk, as well as the Anzac Day clash on the Thursday between Pakenham and Officer. In Division 2, meanwhile, Gembrook Cockatoo were blown away in the third quarter in their clash against Kinglake to open up the season, 10.7 (67) to 14.10 (94). The Brookers took a handy 12-point lead into quarter, but the Lakers fought back with a six-goal to three second term to steal back the lead at half time. But the Lakers were in devastating touch in the third, slamming on 6.3 to zero to open up a 47-point advantage with a quarter to play, a deficit the Brookers couldn’t reel in despite fighting out the game. In the other matches, Powelltown defeated Yarra Junction, 16.9 (105) to 12.10 (82), Yarra Glen belted Thornton Eildon 21.24 (150) to 8.6 (54), while Seville outclassed Yea by 138-points, 24.25 (169) to 4.7 (31).